Believe the hype! Oatmeal really is good for you. In fact, more than 40 studies show that eating oatmeal daily may help lower cholesterol and reduce the risk of heart disease. And if that's not enough, oatmeal is also a great source of fiber, which helps to slow the rate of digestion. The result? Stable blood sugar levels and a curbed appetite. Woohoo! Best Oatmeal Bet: Quaker Old Fashioned Oatmeal. This Quaker classic we all know and love, contains 100% natural oats--and nothing else. And while this oatmeal might not have the word "quick" in its name, it still only takes about 5 minutes to make. This type of oatmeal's a big winner cuz it contains the most whole oat groats and all the parts of the oat grain, including the bran, endosperm and germ portion (sounds creepy and somewhat dirty, but it isn't). This oatmeal is also the heartiest and thickest. And it's the best for stabilizing blood sugar levels, which actually makes you feel fuller. Steel cut oats are also a great option. Fish is a healthy food for many reasons. First off, most kinds of fish are low in calories. In addition, fish is protein-packed and satisfying. Best of all, it's a great source of Omega-3 Fatty Acids. 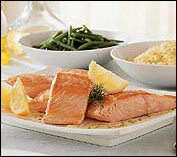 Omega-3's have been found to help prevent wrinkles, cancer and heart disease. They're also even thought to ease symptoms of depression. HG Tip: If you eat canned fish, like tuna, be sure to get the kind packed in water instead of oil! There's a reason they say an apple a day will keep the doctor away. 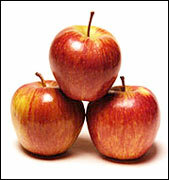 Apples are some of the healthiest foods on Earth. Why? First off, they're high in fiber, with about 3 grams of the stuff apiece. Not only does fiber help fill you up and keep you full, but it also helps to prevent high cholesterol and heart disease. Need some more reasons why apples rock? They're only 80 calories (per medium apple), they're delicious, and they're vitamin-rich. HG Tip: Want a new way to enjoy this old fave? Chop your apple up, then top it with half a carton of Yoplait Light yogurt in Apple Turnover. This delicious orange colored fruit contains two times the recommended daily dose of Vitamin C per half melon. That same half a melon also contains twice the potassium of a banana. Impressive! And if that weren't reason enough to jump on the cantaloupe bandwagon, the stuff also has tons of beta-carotene, an antioxidant that helps protect cells from free-radical damage. This cool and refreshing fruit contains less than 100 calories and 1 gram of fat per half melon. It's a perfect snack or breakfast option. Not only is broccoli cute (come on, mini trees?! A-dorable! ), but it's good for you, too. Broccoli contains lots of vitamin C and beta-carotene, and has been shown to help prevent and fight breast cancer. One cup (chopped) has just 25 calories and no fat. And, that same cup also contains 3 grams of heart healthy fiber. Steam these stalks, then spritz with low cal butter spray, or top with tomato sauce and parmesan cheese. Either way, you'll be doing your body good. Garlic is pungent--in more than just taste. It also is strong when it comes to the effect it has on your body. What exactly can garlic do? Well, it can lower LDL ("bad") cholesterol, lower blood pressure and even reduce your risk of stomach and colon cancer. Pretty good, huh? And you don't have to worry about wracking up the calories when you use it. A clove only has four of 'em. Put this stuff on or in almost any savory food, especially in Italian based dishes. In fact, you can even bake a whole head for 15 to 20 minutes, until soft and sweet, and then spread it on bread instead of butter. Yum! Remember, May is National Egg Month! There's still time to egg it up, friends! To save calories and fat, use the whites only, or use one yolk for every three eggs you eat. Share these HG-rific picks with pals. Click "send to a friend" NOW!